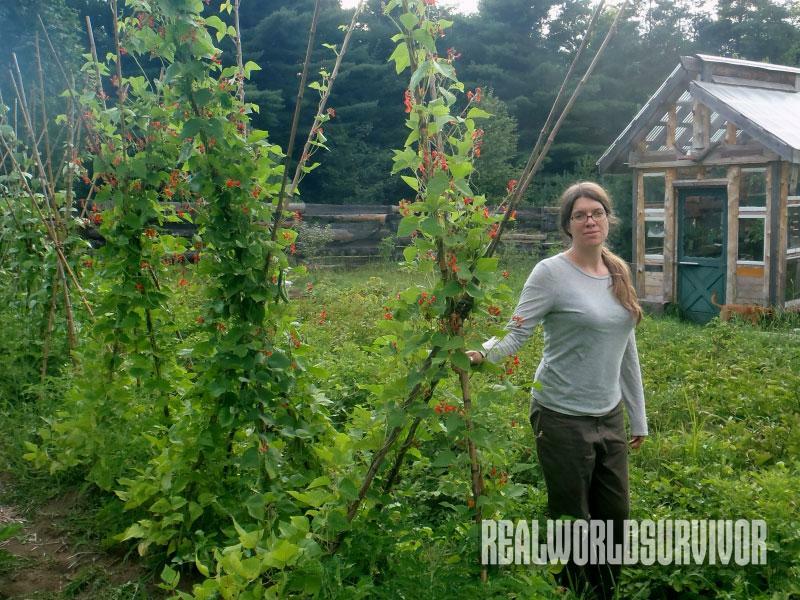 Carrie Zelazowski standing next to a trellis filled with Scarlet Runner beans. Her greenhouse is in the background. To get maximum production from a small space, plant fruit and vegetable varieties developed to do well in your location. The author poses with her Adirondack Blue potatoes, a variety named after the mountains near where she lives. 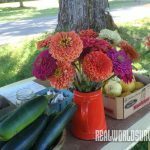 Each summer, the author sells vegetables at a small farm stand in her front yard. Zucchini, one crop that she has decided to focus on in her garden, is consistently a best seller. In 2014, the author dedicated one-quarter of her garden to potatoes, which she knows grow well in her sandy soil, store well over the winter and are popular with her customers. She sold half of her potato crop and kept the rest for her own use. Plant varieties that do well in your location and climate. For a market crop, don’t plant the same things people around you are growing. Find a niche crop. Grow vertically whenever possible. 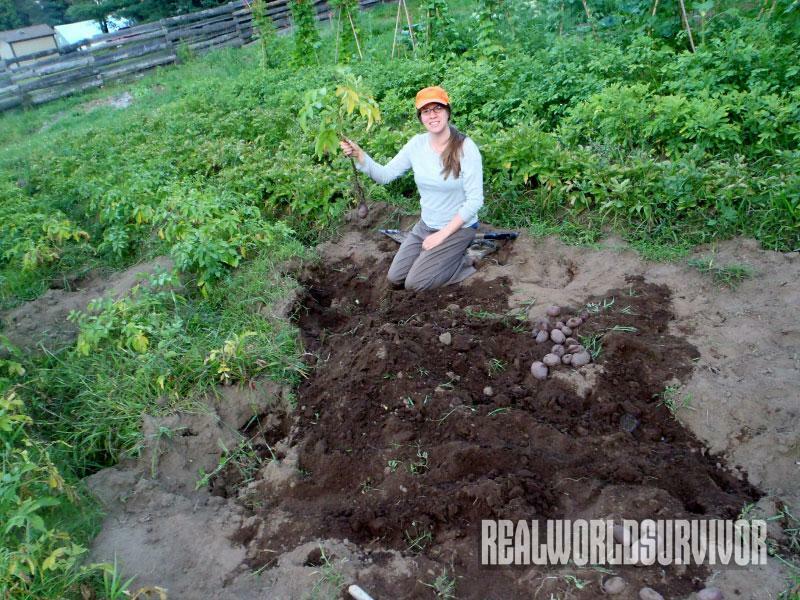 Don’t plant veggies like large winter squash that require lots of space. Also, Limit the amount of space you use experimenting with new varieties. Practice successive planting. Also, use crowd planting to conserve space and control weeds. When people think of a productive homestead farm they may picture a log cabin and a pond with ducks and cattails. A sugar shack for boiling maple syrup and bee hives buzzing with activity could be in the scene. Livestock may graze happily in a pasture lined with tall apple trees. A dozen chickens may peck and scratch in front of a large red barn. 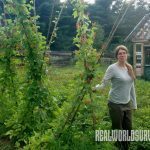 And, of course, no profitable homestead would be complete without a sprawling, multiple-acre garden; anything less elaborate may seem like a hobby, rather than a homestead. But some of us don’t have the luxury of utilizing that much space. We’re left trying to figure out how to make our little slice of land productive. My husband, Jeremy, and I have only one acre in upstate New York. The property originally belonged to Jeremy’s grandmother, and we moved there in 2010. We wish it were bigger, we’ve done our best to maximize what space we have. Jeremy puts his skills to use maintaining and improving the property, and I focus my attention on food production. 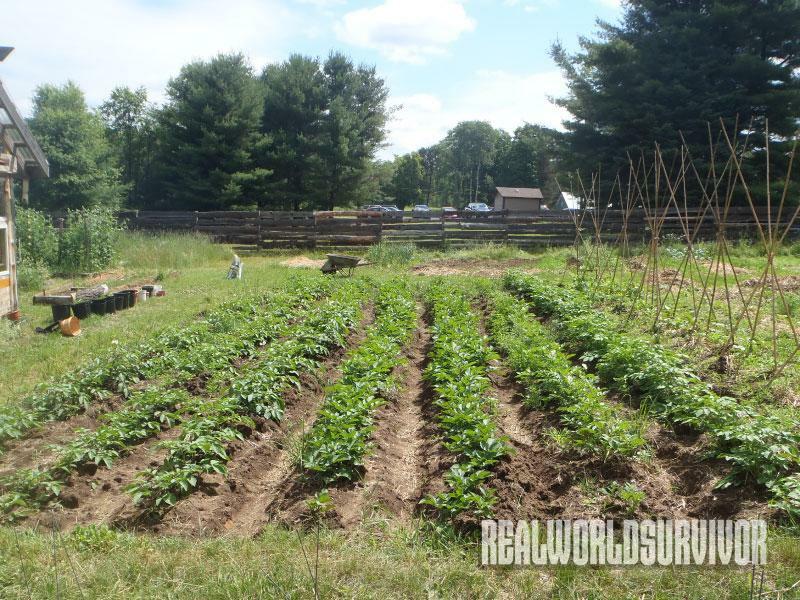 We have room for only a 1/4-acre vegetable garden on our land. Each year my goal is to grow enough produce for Jeremy and me to consume, and have some leftover to sell. It may sound pretty basic, but I’ve come to realize that it takes a bit more thought and planning to utilize space properly when you don’t have a lot of it. I simply can’t afford to dedicate part of my garden to something that may not grow well or will take up too much space. With each growing season I’ve learned different planting strategies. 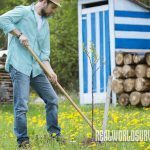 Through my experiences, I’ve narrowed down what I will or will not grow and have found ways to get the most out of my land. 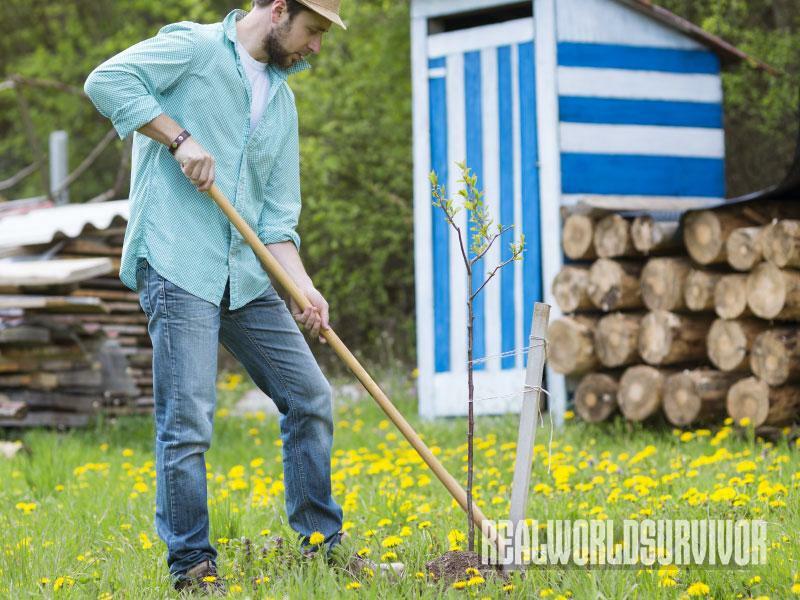 Everyone’s property is different, but there are some basic things to be considered when striving to use a tiny lot to its full potential and make a little money off of it, too. Four years ago, when I was deciding what I should or shouldn’t plant in my garden, I did some investigative work. I drove around my community and past nearby farms. 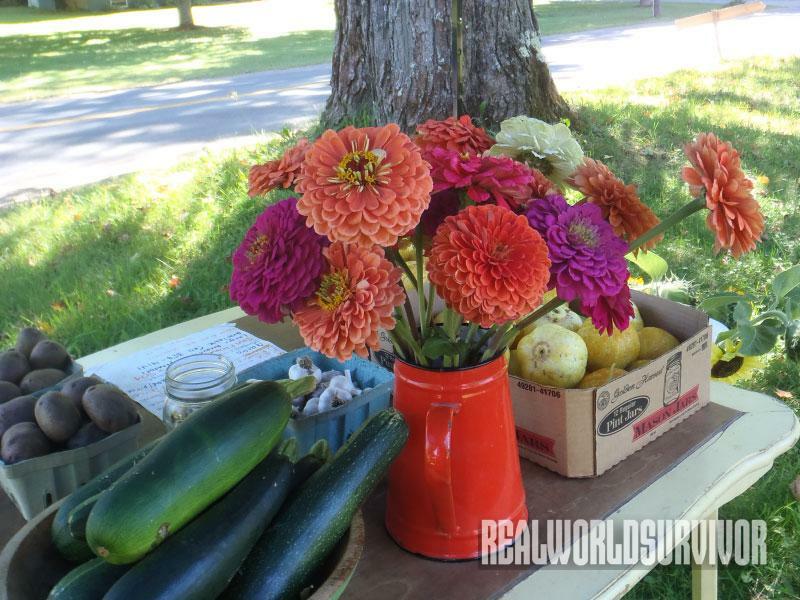 I visited my community’s farmers market to take stock of what my neighbors were growing. My home is surrounded by farms with acre upon acre of sweet corn, so I decided it really wasn’t worth it to dedicate a portion of my property to that crop. Also, I didn’t have enough land to grow corn in excess, so I wouldn’t have any extra to sell. As much as I love fresh sweet corn in the summer, it makes more sense to drive down the road and buy some, and use my limited garden space for potatoes. They grow fabulously in our sandy soil and not many people sell them at the local farmers market. Over the years, potatoes have become my signature vegetable. It’s my largest and most profitable crop. To maximize my tiny parcel, I needed to take into account the end uses of each crop that I consider growing. Vegetables and fruits that fulfill multiple eating purposes are less likely to go to waste, and therefore make the most sense to grow and the best use of land. To further illustrate this point, I like to compare spinach and lettuce. Spinach can be used for soups, salads, on pizza, combined with basil to make pesto, and it can be tossed into tomato sauce, stir fries and many other dishes. Lettuce is usually used in salads and on sandwiches. Obviously, lettuce doesn’t have the versatility that spinach does. Therefore, garden space for leafy vegetables is put to better use when dedicated to spinach rather than lettuce. Easily preserved vegetables and those with good, long-term storage qualities (like my potatoes) are a good addition to a small garden. When a crop can be easily preserved, the piece of land on which it was grown is utilized more effectively than if it were planted in a crop with minimal preservation opportunities. Again, I’ll compare lettuce and spinach. In most cases, lettuce can’t be preserved, so if it’s not eaten or sold, it likely ends up in the compost pile. Spinach, however, is able to be steamed and frozen, and is a vitamin- and mineral-rich contribution to soups, frittatas and omelets when thawed. Every variety of vegetable and fruit is unique and grows and produces in a different manner. I carefully read plant descriptions to learn their characteristics before choosing what seeds to plant. As a rule I buy seeds that produce large, abundant fruit. If a plant is going to take up space in my garden, it has to do just that. The Mortgage Lifter tomato is one of my favorite tomatoes, and I initially picked it because of its name. While it may not have paid off any substantial bills that I owe, each year my Mortgage Lifters provide large, plentiful tomatoes. At first it seemed logical to grow tomato plants that create small fruits, such as grape varieties. With my limited knowledge, it made sense that they would take up less space. This, I discovered, is not always true. In my first year of gardening, my grape tomato bushes grew to be the same size as other plants that yielded tomatoes five times larger. After that, I put a limit on grape tomato plants. In 2014, of the 100 tomatoes that I planted (most of them Mortgage Lifters), only 10 were grape. I’ve adapted the large-fruit theory for pumpkins as well. For years, I grew small Sugar Pie pumpkins. In 2014, I grew Connecticut Field pumpkins, which are substantially larger. I’ll admit that the total plant size was bigger than that of the Sugar Pie, but the fact that they produced larger pumpkins made the use of that space more worthwhile. The larger pumpkins sold better, too. Even though my main vegetable and fruit focal points have been established, there’s always an urge to be adventurous and try something new. After all, those heirloom seed catalogs can be pretty tempting. However, working within a small space doesn’t leave much room for failure. I stick to plant varieties that are tried and true, and that I know will sell well. I limit my planting experiments to one or two new crop varieties a year, and I allot just a small area of the garden to them. While it’s good to expand horticultural horizons, there’s always the possibility that a new cucumber or carrot variety is a total flop and the parcel dedicated to it ends up wasted and unprofitable. 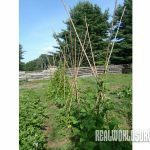 It took years to realize that I had to grow many more vegetable and fruit plants than I expected if I wanted to make money. At first, I grew only 10 cucumber plants and 10 zucchini plants. They produced plenty for Jeremy and me, and a few to sell at my front yard farm stand. But when I took 10 extra zucchini squash to a woman who sells my potatoes, she laughed at me. Her business was small, but she sold approximately 50 pounds of zucchini a week. I upped the ante in 2014 and grew 50 zucchini and 100 cucumber plants. They took up about a quarter of my garden. As usual, Jeremy and I had plenty of zukes and cukes to eat fresh, pickle and freeze. But I had an extra 75 pounds to sell at my farm stand (the zucchini was my best seller) and to the woman at the local business. 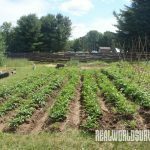 Similarly, in 2014, I allotted one-quarter of my garden to potatoes, much more space than the 20-by-20-foot plot I gave them three years ago. I grew approximately 350 pounds of potatoes. Again, this was enough for Jeremy and me, my farm stand, and the local business (for which I was the sole potato provider). I also had plenty to barter with, give away, sell to friends and family, and save for my 2015 seed potatoes. With potatoes, zucchini and cucumbers taking up the most room in my garden, it makes sense to grow things vertically in the remaining space. After all, my garden is horizontally challenged and I’m running out of room! Peas and beans work well in these situations. 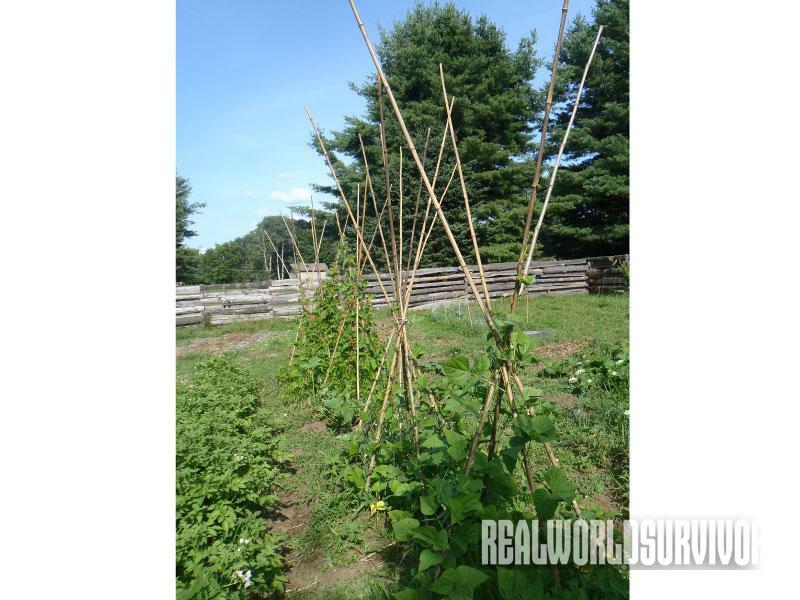 I invested in tall poles and fencing that allow my peas and beans to climb, climb, climb. 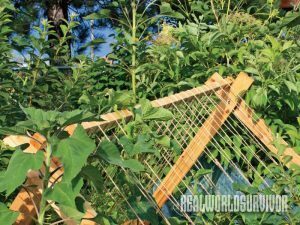 My peas are grown in long, narrow raised beds in which I erect two, 4-foot-tall trellises that run lengthwise. 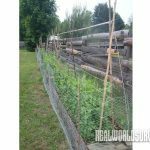 I plant peas on both sides of the trellises to maximize the space. 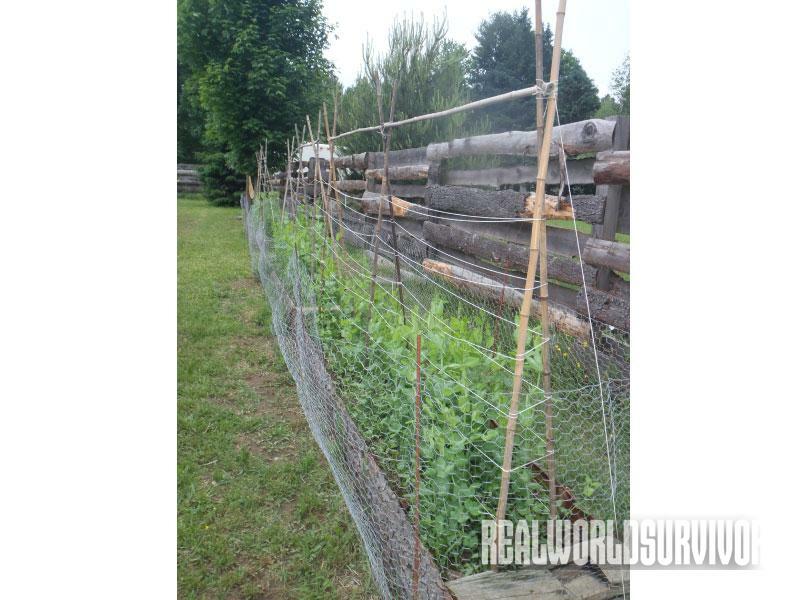 Peas also are one of the vegetables that I can plant multiple times during the growing season. This process is called successive planting. I do this with radishes, too. 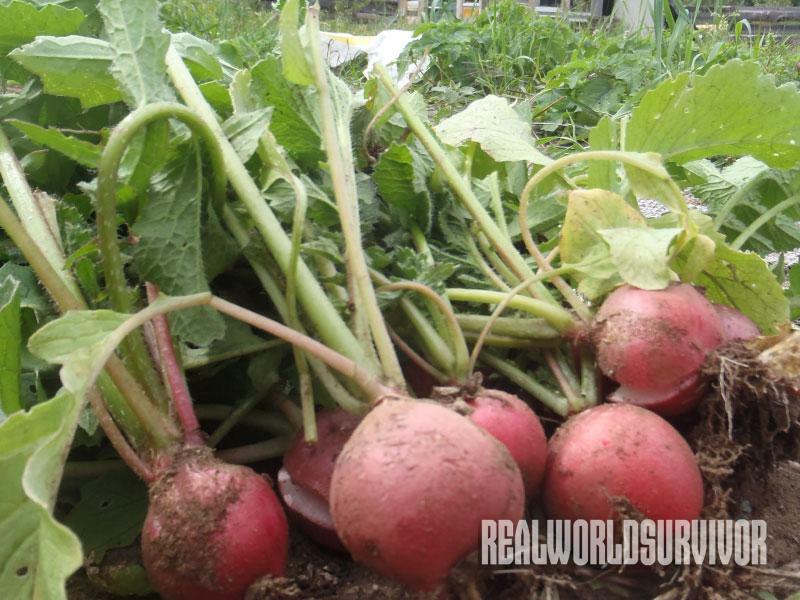 Some radish varieties can be harvested in 25 days. Instead of leaving the radish patch uninhabited after the initial harvest, I plant them again and dig up another crop in a month. I do the same with peas, although they prefer cooler temperatures and take longer to produce. If I’m feeling ambitious, I don’t wait until the first crop is ready to start planting new ones. 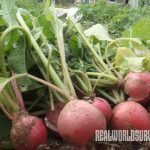 I replant every two weeks, which shortens the time between harvests and ensures that I have a consistent bounty of radishes and peas throughout the season. I’ve also learned to incorporate crowd planting into my garden. Crowd planting involves growing plants as close together as possible. This method allows me to grow more plants in a smaller area. A great way to utilize space, crowd planting serves another purpose—controlling weeds. Growing crops closer together shades the weeds so they don’t get the sunlight needed to thrive. Since most people dislike weeding, crowd planting is a good idea for any garden, big or small. Now that I have my gardening strategies almost completely ironed out, I look forward to the 2015 growing season, knowing for sure that I can make it more productive and profitable than the previous year. This year, I’m going to start selling at a local farmers market in addition to my farm stand and the local business. I’ll grow more plants and put them closer together, and Jeremy will build additional raised beds for more peas and beans. 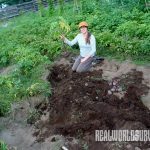 Of course, these things will require more work and time, but I know that the effort invested in my one-acre homestead is worthwhile and necessary if I want to make the most of it.